This memorial truly has The Right Stuff. 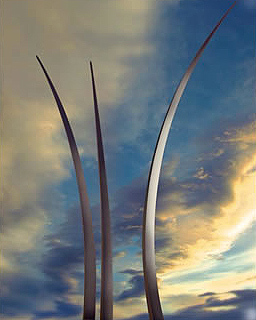 Inspired by a military air maneuver called the "bomb burst," the Air Force Memorial insires flight, speed, and the heavens. It's a beautiful, "soaring" tribute to the men and women of the Air Force branch of the military. I look forward to more pictures in the near future. I saw a PBS piece on the memorial. Didn't realize Ross Perot's son was involved in getting this created. I really want to see the work in person. I'm sure it would be emotional. I was unexpectedly moved when I visited the Vietnam memorial. It's sobering, especially when you visit the database of Iraq Coalition Casualties or Beautiful Dead Girls. So many people died in these conflicts. War is hell...and takes from our society its best and brightest. I'm eagerly anticipating more pictures and video footage of the memorial. I'll post more here as I find it. God! This memorial looks absolutely spectacular!